On November 26, the InSight Lander safely landed in the Elysium Planitia region of Mars. It is amazing how NASA’s Jet Propulsion Laboratory (JPL) has made landing on Mars look so easy. It is not. Years in the making, this joint American, French, and German collaboration, has the primary mission to measure seismic activity on Mars (or “Marsquakes”). Several Astrogeology Science Center employees gathered to watch the live feed broadcast from mission control at JPL in Pasadena, California. Photo Credit: Patty Garcia/USGS. Ecstatic cheering erupted from mission control once the touch-down was announced and the first dusty image was shown. InSight team members at Astrogeology also breathed a collective sigh of relief since they helped to create the InSight landing site maps. These maps are used to assess whether the site is safe to land on. 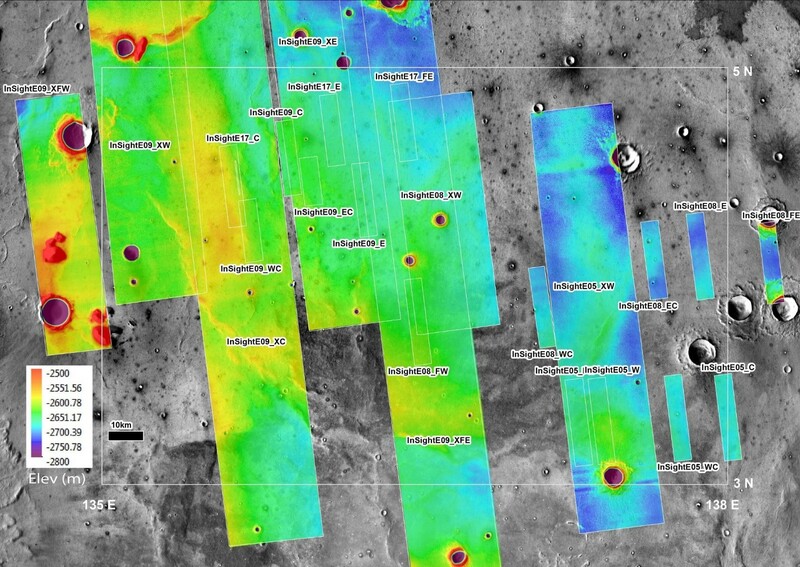 In fact, Astrogeology employees have created 8 landing site maps for 8 seperate successful Mars robotic landings by NASA. This image from Fergason, 2017, shows the Astrogeology-created CTX (20 m/pixel) and HiRISE (1 m/pixel) topographic maps, colorized by elevation (m), in support of landing site selection for InSight. The grayscale THEMIS daytime infrared controlled mosaic (100 m/pixel), also by USGS, underlays the topographic layers. Topographic-based landing site maps are generated by combining several pairs of stereo images. Dr. Robin Fergason, a planetary scientist at Astrogeology, led these efforts for NASA. For more information about our InSight support please see this paper: Fergason, R. Kirk, R.L., Cushing, G., Galuzska, D.M., Golombek, M.P., Hare, T.M., Howington-Kraus, E., Kipp, D.M., Redding, B.L., 2017, Analysis of local slopes at the InSight landing site on Mars. Space Sci. Rev. 211, 109–133. https://doi.org/10.1007/s11214-016-0292-x.